Shock in West Papua as a teenage Papuan high-school student was fatally shot by Indonesian police Special Forces in the centre of Nabire City, on 27 June 2016. Oen “Owen” Pikei was shot dead after being chased by three militarised vehicles. According to reports and witnesses from the scene, the shooting had been deemed a “premeditated ambush without provocation”, as the student was unarmed. One witness, claims that Pekei was seen riding on a motorbike carrying a noken bag bearing the outlawed Morning Star pro-independence symbol. Police gave chase with three motorbikes, three unmarked police vehicles, and a truck full of fully armed and armoured Densus88 anti-terror police in balaclavas joined the chase. Pekei was herded into an ambush area, where more Densus88 armed members of the police were awaiting him at three points, according to the witness. Pekei was then shot in front of the new city complex at the Nabire regent’s office, allegedly from several directions simultaneously. UmagiNews has published a series of diagrams given by witnesses showing from where different armed units shot Pekei. One shot from Telkom head office, the second from within the memorial monuments, and the third from the D88 cars of Dalmas Porles Nabire. Unconfirmed reports seen by West Papua Media stringers allege that among the shooters, both waiting and chasing Pekei, were a heavily armed patrol of black clad special forces police belonging to the Australian-trained and funded counter-terror unit Special Detachment (Densus) 88. Densus88 has been used extensively for several years to conduct extremely violent repression against Papuan civilians engaged in peaceful acts of free expression, and is currently deployed heavily across Papua, whilst still receiving funding and training from the Australian Federal Police. The motive for shooting is not clear, however police have denied – in the military run colonial media outlet NabireNet, that they shot Pekei, claiming instead that he died in hospital after hitting his head during the crash. However, human rights observers say that questions arose that if Pekei was considered a road accident victim who was unconscious, why he was dumped in the mortuary instead of receiving an attempt to revive him in the emergency room of the hospital. Other circumstances surrounding the shooting have not been confirmed at time of writing, and Indonesian police in Nabire have refused to answer phone and SMS messages from West Papua Media and local stringers. 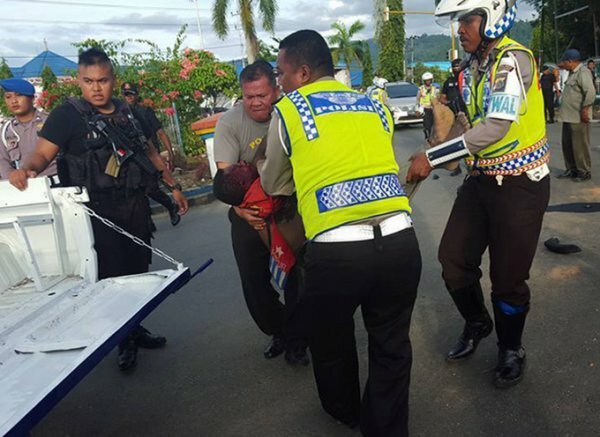 A human rights monitor in Nabire who exposed the news observed that the “Motive appears unknown (as) conducted by the police, but people of Papua demand the Indonesian state carries out a just ‘crack down’ on any human rights violations that occurred”. This shooting is not the first time an event like this has occurred. On 5 December 2014, the Bloody Paniai incident occurred that left four unarmed Papuan teenagers dead and 17 more Papuans injured when the Indonesian army and police opened fire on peaceful protesters in Paniai. Some Papuans who gathered outside the Regent’s office after the killing saying that they “questioned the Indonesian government’s seriousness in resolving human rights violations by the Indonesian military”. “Bloody Nabire has returned, the security apparatus of the Republic of Indonesia is shooting the indigenous people of West Papua, using the tools of State (guns)”.